1. The publication of the ESCWA Technical Report titled “Guidelines on Fostering Innovation in the Public Sector of the Arab Region”. The guideline provides various types and examples to help governments, public institutions and agencies galvanise innovation. The study goes further, providing several models designed to serve as aides in the selection, design and implementation of innovation practices and initiatives by Arab public sectors. 2. 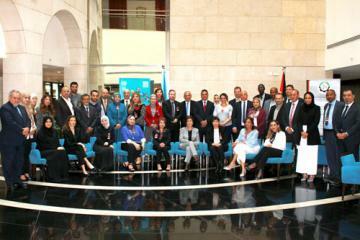 The publication of the ESCWA report titled “Community-based Innovation for improved social well-being”. This report explores the issues of social well-being in the context of communities and the way innovation and technology can be instrumental in alleviating these issues. It provides communities and civil society with suggestions on innovative tools and practices that, when implemented, could, improve social well-being. 3. The UN-Wide, ESCWA Capacity Building Workshop on Innovation Policies for SDGs in the Arab Region. In the framework of the Work Stream 6 (WS6) of the UN-Inter-Agency Task Team on Science, Technology and Innovation (IATT-STI), ESCWA together with other UN agencies: UNCTAD, UNDESA, UNIDO, UNESCO, UNU-Merit, and WIPO organized a capacity building workshop on Innovation Policies for SDGs, in Amman between 15 and 19 April 2018.